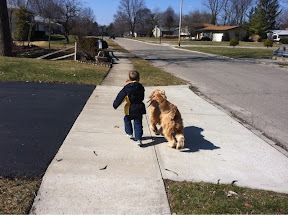 WingerBLOG: 20110302 - Who's walking who? 20110302 - Up, fast day at the desk. Did take a walk with Lilly and met up with G&L on their way home from the sitter, so G, Lilly & I walked home together. Pretty funny as G took the leash; hard to tell who walking who... Home finished off the day. Outside with the boys to play our first game of flag football for the year. I had a couple of incredible falls and know I will be SORE tomorrow... To Lenscrafters to get D's glasses ordered and Meijer to get supplies. Home and watched some American Idol with the fam. All boys to bed and I read 'Little Red Riding Hood' to the boys. It made G VERY scared! Out one last time to get a midnight snack for L&I.